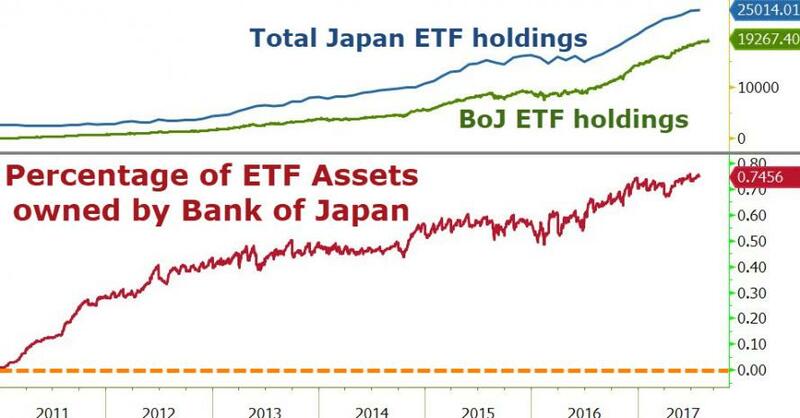 When it comes to Japan's risk assets, it is a widely - in incorrectly - accepted that only the Bank of Japan matters: and with Kuroda now a proud owner of nearly 80% of the country's ETFs and the BOJ a top 10 shareholder in nearly 40% of listed companies, one can see where this perception comes from. However, when it comes to Japanese, and international, stocks there is one whale that is far more impactful than even the BOJ when it comes to capital allocation and the fate of risk assets: Japan's gargantuan Government Pension Investment Fund (or GPIF) - the largest in the world - which manages 156 trillion yen ($1.41 trillion), and whose assets are broken down in 4 main categories: Japanese bonds, Japanese stocks, overseas bonds and overseas stocks. As the Nikkei notes, the GPIF earned the moniker as a "whale" in the stock market due to its massive holdings of domestic stocks. Previously, a greater weight was given to less risky domestic bonds, which amounted to 62% of total assets as recently as 2012. The historical distribution of the GPIF's asset holdings is shown in the chart below: what is notable is that as a result of a mandated shift in its asset allocation several years ago, the fund which traditionally had a conservative posture with the bulk of its assets - usually as much as 70% - in the form of domestic bonds, had since shifted to a stock-heavy allocation, with the target allocation for domestic and foreign stocks rising to 50%. And here a problem has emerged, because the GPIF's portfolio has exceeded its 25% allocation target for domestic stocks for the first time, a milestone that - unless the world's largest pension fund changes its strategy for stable returns - could have severely adverse consequences for local risk assets. 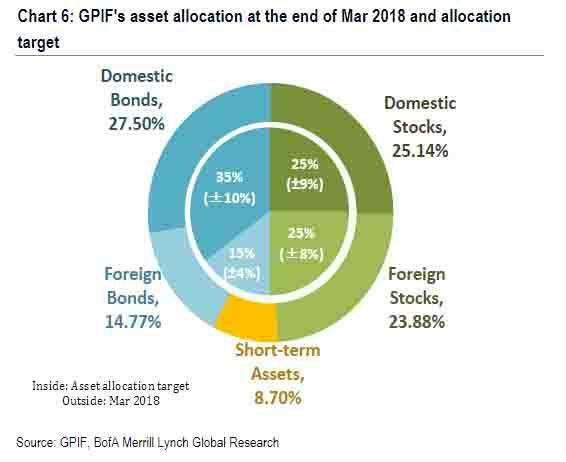 According to a filing last Friday, Japanese equities accounted for 25.14% of the GPIF's portfolio at the end of March. That equates to over 40 trillion yen worth of shares covering roughly 2,300 issues. Just like the BOJ, the fund is believed to be a major shareholder in many companies listed in the Tokyo Stock Exchange's first section. In fact, the GPIF is often seen as a tack-on to the BOJ, because as the GPIF sells its Japanese bond holdings to the BOJ usually at prices well above market value, it opens up more space to buy equities, thereby creating a feedback loop in which the BOJ's purchases of JGbs indirectly result in higher stock prices, with the GPIF as a conduit. For now the strategy of dumping Japan's pensions into the stock market has been a smashing success: in fiscal 2017, the GPIF posted an investment return of 10.08 trillion yen. There is just one problem: with the whale by far the biggest market player in Japan's stock market, its buying was sufficient to lift stock prices, thereby creating a virtuous cycle in which the more the GPIF bought, the greater its return. That may soon be over, however, now that the GPIF has hit its limit on how much domestic stocks it can buy. The GPIF's impact on Japan's stock market in recent years has been staggering. Shinzo Abe's government, hoping to boost the "wealth effect" by creating higher stock prices, resolved to reduce the GPIF's reliance on Japanese government bonds while boosting stock holdings instead. In October 2014, the GPIF revised portfolio allocations and set a 50% aggregate target for equities at home and abroad. According to the Nikkei, since 2014, the GPIF has bought an estimated 6.36 trillion yen more in domestic equities than it sold, equal to about 1% of the TSE first section's market value. "That computes to lifting the Nikkei Stock Average by about 1,000 points," said Masahiro Nishikawa, chief fiscal policy analyst at Nomura Securities. To be sure, worried that domestic investors will dump their shares now that the "whale" is no longer a backstop buyer for Japanese stocks, GPIF President Norihiro Takahashi said that although Japanese equities have topped the 25% goal, the ratio can exceed the target by a few percentage points. "Investment will not stop." Translated: please don't start a liquidation cascade. And yet despite wishful thinking, "the GPIF is now less likely to be a force that elevates the market as it did in the past" the Nikkei admits, for the simple reason that it can no longer aggressively invest in stocks absent yet another change to its asset allocation target. Japanese bonds still occupy the largest slice of the GPIF's portfolio, but to a lesser extent. As shown in the chart above, the allocation to bonds stood at 27.5% at the end of fiscal 2017, well below the 35% target. A big reason why the fund has had trouble procuring the bonds is because another whale, the Bank of Japan, is also mass purchasing JGBs. Meanwhile, with the GPIF's buying having created its own bullish sentiment, now that the buying is over the fund has two options: risk a sudden drop in the market, one which comes as the BOJ is creeping ever closer to its own QE end as Japan runs out of JGBs for sale, or expand the fund's allocation to stocks further. And in an attempt to keep the party going a little longer, it is obvious that the choice will be the latter. Unfortunately, as both a Japanese and global recession - and market crash - gets ever closer, all this will do is jeopardize even more Japanese pensions. The real question is just how angry Japan's population, already the oldest in the world, will be once it learns that much - or all - of its pensions were lost in the government's vain pursuit of further market gains, and to keep Abe's popularity rating high. With the US economic cycle already the second longest in history, we doubt we will have long to wait for the answer.